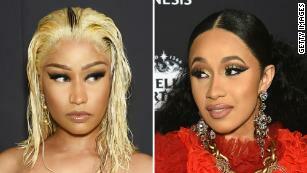 New York (CNN) Nicki Minaj and Cardi B’s feud has reached a fever pitch. The rappers were seen leaving New York Fashion Week’s annual Harper’s Bazaar Icons party late Friday at the Plaza Hotel when a fight between the two stars broke out. It’s unclear what caused the quarrel to escalate, but Cardi B took to Instagram afterward and posted a profanity-filled video saying Minaj had criticized her parenting skills. Last year both artists were featured on the song “MotorSport” alongside Migos. CNN has reached out to Cardi B’s and Minaj’s representatives for comment. CNN’s Augusta Anthony contributed to this report.